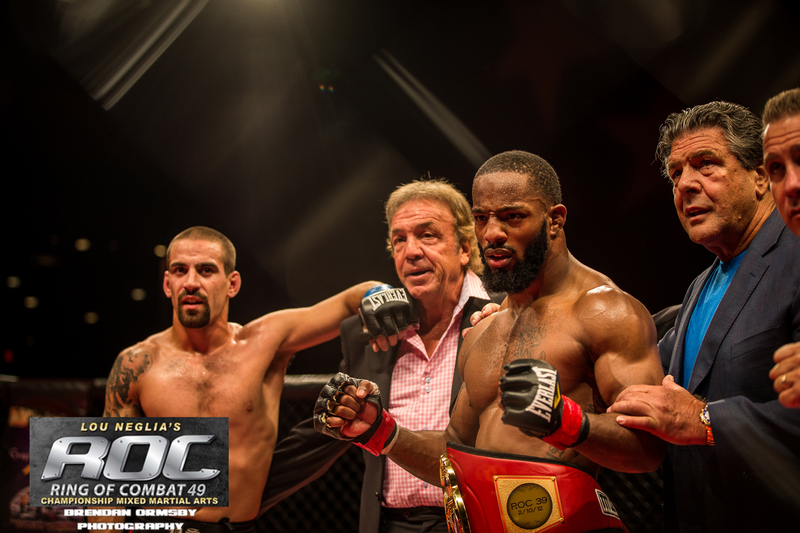 Andre Harrison Returns To Where It All Started | Lou Neglia's Ring of Combat | Next Generation of Mixed Martial Arts! For Andre “The Bull” Harrison (14-0), ROC 57 is special for two reasons. One, it marks the return of Harrison who is the former ROC featherweight champion. Two, it will be exactly five years to the day when Harrison made his professional debut also under the Ring of Combat banner. After being victorious in his debut, Harrison quickly showed he was a mission as he racked five wins in a row before challenging for the ROC featherweight title. At ROC 45, Harrison would take on Matias Vasquez for gold. He quickly established he was on a different level not only from Vasquez but from most featherweights period. He would win the title with a first round TKO and would then defend his title at ROC 49 against the ultra tough, Jeff Lentz. After five gruelling rounds, Harrison would again be the victor via split decision. Andre Harrison would then get the call to compete over at Titan FC, another top regional MMA promotion. The Bull would go on to win their featherweight title and defend four times! Now as they say in the movies, HE’S BACK! Andre “The Bull” Harrison returns to the place where it all began. “Fighting at home is always a fun time,” said Harrison. “My local family, friends, and fans are able to come out to support since I’m here. That will just make winning that much better because they can see me do what I love and what I do best live. Also, we’ll all be able to celebrate what “W” afterwards together so that will be awesome,” he continued. The Bellemore Kickboxing prodigy has plenty of team support to get that win. “Training camp has been great,” said Harrison. “My body feels great. I’ve been getting some great sessions in with my amazing teammates. Dudes like Chris Algieri, Tom English and Codie P,” he continued. There is a system Andre follows when it comes to training and rather than work on different things, Andre just keeps working. “I wouldn’t say I’m doing anything different per se,” said Harrison. “As always I’ve been working on becoming a better well rounded fighter, a versatile mixed martial artist so I’ve been working on strengthening all of my disciplines in preparation for this next fight,” he continued. When he steps foot in the cage at the Tropicana on November 18th, staring across from him will be Julian “Night Train” Lane (11-6-1). Despite Lane coming off a title challenge loss at ROC 56, he is not someone who Harrison is taking lightly. “I think Julian is a tough guy, a good competitor, and I look forward to meeting him in that cage,” said Harrison. In addition, Harrison is still planning to be victorious. “Fans can expect an explosive bout, a more refined Dre “The Bull” and for my hand to raised in victory,” he continued. In an age where most fighters are lucky to see two-three fights in a year, this will mark the fourth time in 2016 where Harrison has seen action. “It’s simple, the busier I am, the better I become and the more money I earn,” said Harrison. “As long as I’m healthy, I’m always ready to get in that cage and get some more “W’s” under my belt,” he continued. Andre Harrison vs Julian Lane takes place Friday, November 18th, at the Tropicana Atlantic City showroom. Tickets can be purchased at the Tropicana box office, any TicketMaster outlet or from the ROC website. Get yours today!